In 2014, Eiko commenced her solo project, A Body in Places, through which she has been creating works that aim to explore the relationship of a fragile human body and the myriad intrinsic traits that are contained by a specific place. While her work with Koma created and used the drama of a duo, performing alone, her partner becomes the idiosyncratic elements of the places she occupies and those who watch. 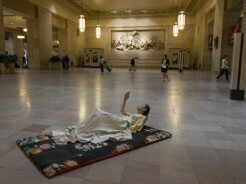 Starting with A Body in a Station, in October 2014, Eiko took her exploration to Philadelphia's 30th Street Amtrak Station. 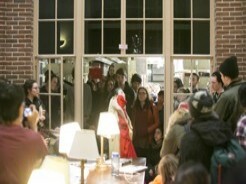 Created with the support of the Pennsylvania Academy of the Fine Arts (PAFA), she performed four consecutive Fridays, for three hours each. The project also took her to Fukushima, in response to the Fukushima Nuclear Disaster. Traveling with photographer William Johnston, she danced in the desolate, irradiated landscapes, communing with the grief and dark beauty of these abandoned towns, beaches, train stations, and roads. 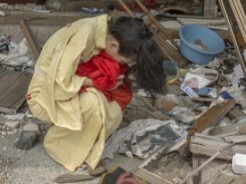 Their collaboration led to the work, A Body in Fukushima and the resulting photo exhibitions served as the conduit through which her performances in Fukushima were connected to an audience occupying a different plane of time and space, highlighting the collapsed distance between the disaster and subsequent considerations to be made. 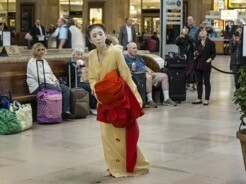 Presented as part of the Lower Manhattan Cultural Council's River To River Festival, Eiko will bring A Body in a Station to Fulton Center in Lower Manhattan on June 22-24, 2015. Performances at the American Dance Festival (July 5- 12, 2016) will follow. She will also be featured at the Danspace Project's PLATFORM in the winter of 2016.